Glastonbury is legendary for a host of reasons. Its parades, processions and staged events, for example, make headlines locally, nationally and internationally. Whenever I’m a long way from Glastonbury, perhaps chatting in a bar half way round the world and I happen to mention Glastonbury, I find that people have usually heard of the “Glastonbury Festival”, at the very least. I can talk from first-hand experience of this event, having talked to the assembled festival-goers from the Pyramid Stage and having also performed there more times than Tom Jones! This annual rock and pop extravaganza, that always hosts the big names in the pop industry, sees something like 150,000 followers descend on a small village called Pilton, which is actually about seven miles from Glastonbury! Before and after this long weekend of music, mayhem and mud, the roads are clogged with cars for miles on end and it becomes something of a local obligatory pastime to try and find routes to and from work or just about anywhere else, which avoid the experience of being trapped in a five hour nose-to-tail crawl! Once the revellers are all safely gathered in, paradoxically, Glastonbury becomes something of a ghost town for the weekend, although there are steps to make this less so. The processions of a religious nature occur in July. They close the streets for these, as thousands of pilgrims make their way slowly to the Glastonbury Abbey. I have to attend these events along with members of Glastonbury Town Council and our Mayor. We also have two events that are now well-entrenched in the Glastonbury calendar. I refer of course, to the Beltane (May Day) procession and the associated revelry and merriment. The other event, around Halloween, is the Samhain Wild Hunt. Both are now accompanied by Red and White Dragons, copious drummers, Morris Dancers and literally thousands in fancy dress – all with painted faces. For a few hours it’s a photographer’s dream – a photographic paradise. We usually make the National press, at these times, such is the incredible spectacle that this town uniquely and almost effortlessly generates. Also at Halloween, we usually have our Zombie Walk. But this year, owing to road works on the diversion route, it had to be postponed until December 9th. Consequently, our marauding Zombies had the backdrop of a beautiful Christmas Tree in our town centre. Well, everyone enjoys a zombie-infested Christmas, don’t they? The event was organised by the excellent Children’s World charity. It was a great success. I managed to avoid being “got at” by the zombies this year. Last year, however, I was not so lucky! We had Druids in the town too on the same day, but they seemed to generally keep themselves confined to the Town Hall. Usually, the Zombies parade on the same day as the fairies assemble for their Fairy Ball. 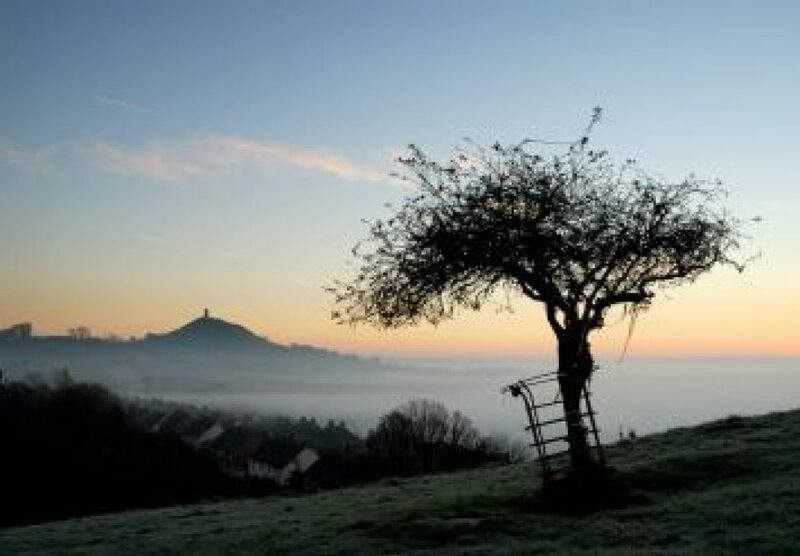 As you probably gather, it’s never dull here in Glastonbury! As Town Crier, I look upon it as my civic duty to warn the local citizens of the impending zombie invasion and I did this for most of the day, well into the evening. After the interview you can hear me warning about the Zombies…..that’s also on the same youtube channel. I’ve had a few close shaves with the Zombies in the past. I got set upon by a few years ago and Jason Bryant, our local press photographer, was there to record the macabre event. The zombies can be very realistic with their makeup with eyes popping out, fake rotting flesh and half decayed brains spilling out of their skulls. A new addition is the “Flashmob” based on Michael Jackson’s “Thriller” which lightens the event with music and some expert choreography. I had quite a long time after my interview to circulate around town and chat with some of my local friends. AT 5 pm, I duly introduced our Mayor, Cllr. Emma George who made a short speech before cutting the tape with her customary great style, unleashing those zombies onto the High Street, once again. It would be lovely if you could donate to such a worthy charity. Any sum, however small, can be used to help children in such a unique way! I’ll leave the link below. Thank you, in advance. 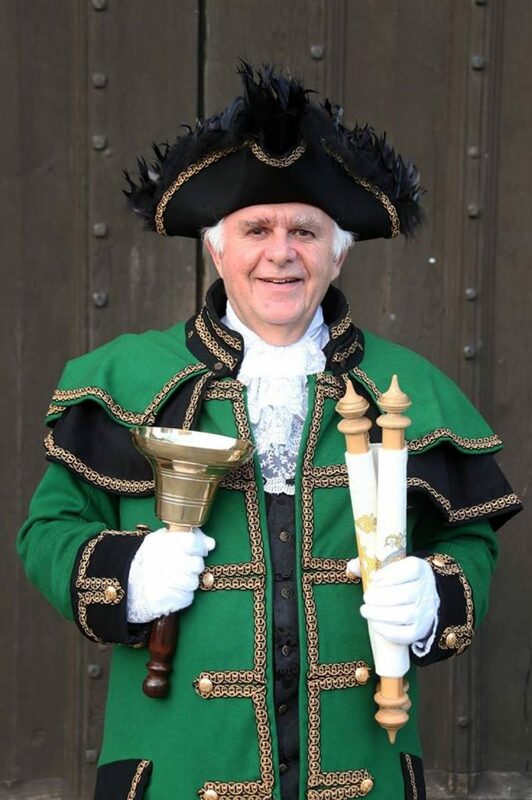 I absolutely love this piece, written by our Town Crier, David Greenway – and so I am taking the liberty of reblogging it. Enjoy! How marvelous for you to be a part of this great event.